Several serious medical conditions can restrict circulation to the head, both during sleep and waking hours. 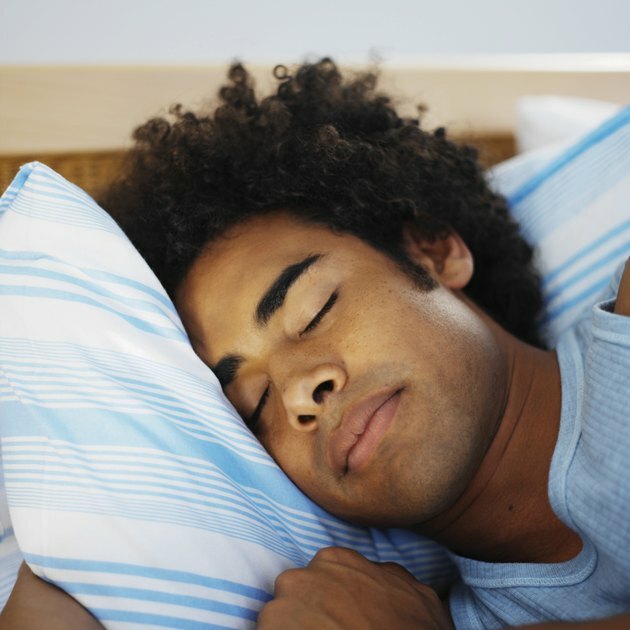 Thankfully, many of these problems can be treated to help restore blood flow to the brain while sleeping. Over time, a reduction of oxygen-rich blood flow to the head can damage brain tissue or even cause a stroke, so doing whatever you can to increase blood circulation in the head during sleep is essential for good health and long life. Obstructive sleep apnea is a common condition marked by periodic pauses in breathing while asleep. It’s caused by tissue in the back of the throat relaxing while you’re lying down, constricting the pathway of air into the lungs. A pause in breathing causes the lungs to gasp for air, which restores breathing. But as these pauses happen many times during the night, the cumulative effect on the brain and blood pressure can be severe as the amount of oxygenated blood reaching brain tissue is diminished. Fortunately, treatments exist, such as a continuous positive airway pressure device that pushes air through a tube and a mask you wear over your nose and mouth to keep you breathing consistently. Surgical procedures that help reduce the amount of tissue in the back of the throat may also relieve the problem. Losing weight, if you have a large neck, can also help. The main arteries carrying blood to the brain are the carotid arteries, which run up the left and right sides of the neck to the brain. Smaller arteries then carry blood throughout the brain. Carotid arteries narrow if plaque, made up of fat, cholesterol and other substances, builds up on the inner walls of the arteries. If the blockage is too great and circulation to the head is stopped or greatly reduced, you can have a stroke. Preventive care, such as managing your cholesterol levels with diet, exercise and medications, if necessary, can preserve carotid artery health. Because your blood pressure tends to rise very early in the morning, which increases your risk of stroke or heart attack if you have serious cardiovascular risk factors, be sure to get the right medication schedule to preserve healthy circulation while sleeping. If blockage already exists, a surgical treatment called an endarterectomy can be done to remove the plaque. Heart failure is a condition in which the heart’s ability to pump blood throughout the body is reduced, meaning the brain and other organs begin to receive less oxygenated blood. Depending on the cause of your heart failure, treatment may include surgery or medications, such as angiotensin-converting enzyme inhibitors and angiotensin II receptor blockers. By treating your heart failure and following your cardiologist’s advice, you can increase circulation to the head and the rest of the body. Some of those medications can interrupt sleep, so check with your doctor if your sleep is affected by your heart failure drugs, because your physician may be able to adjust your dosage, the type of medications you take and the timing of when you take them to preserve a better night's sleep. Exercise improves circulation throughout the body, but even an activity as simple as walking can help boost circulation to the head and preserve brain health. Exercise such as walking improves arterial health in the brain and fosters a better night's sleep. A good night’s sleep is also important to maintain healthy circulation, so you’ll reap two rewards at night from your physical activity during the day. Excessive alcohol consumption can constrict blood vessels, which diminishes circulation. Drinking alcohol late in the evening means alcohol is still in your system while you're sleeping. The constriction of blood vessels reduces circulation in the head, so if you want to increase circulation while sleeping, avoid alcohol less than a few hours before you go to sleep.